Other characteristics of MongoDB are: it has a dynamic schema, it does not support SQL language, it does not support Joins, and it doesn’t support transactional across multiple collections. After you know a bit of MongoDB lets get started with the installation process. 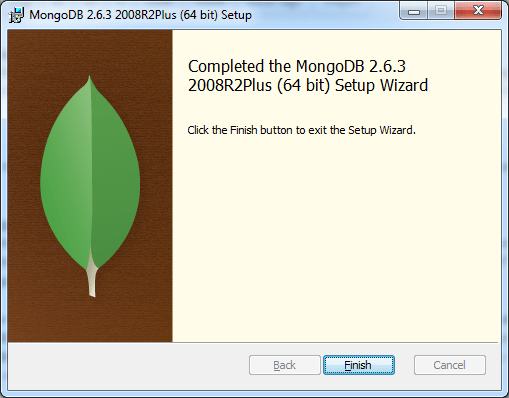 Here are the step by step of the MongoDB installation. 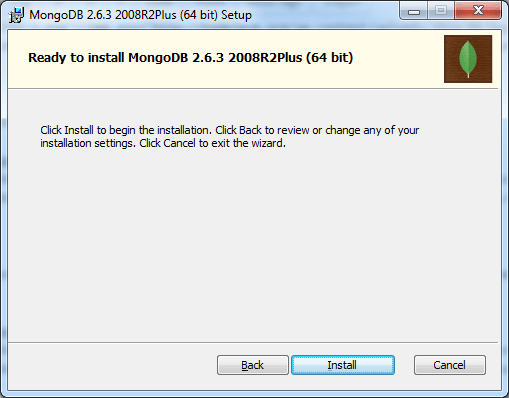 Downloads Windows 64-bit MongoDB installer at https://www.mongodb.com/download-center. When this post is written the binary file name for Windows 64-bit is mongodb-win32-x86_64-2008plus-2.6.3-signed.msi. 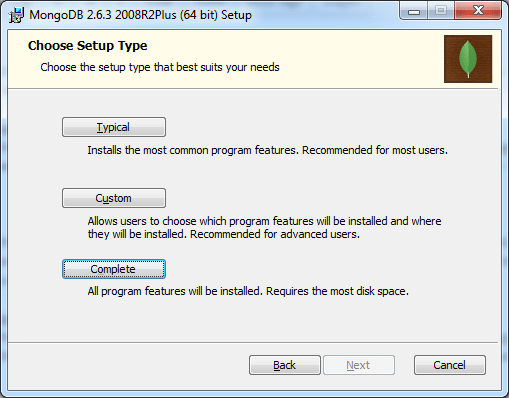 After you have finish the download the installer double click the file to start the installation wizard. 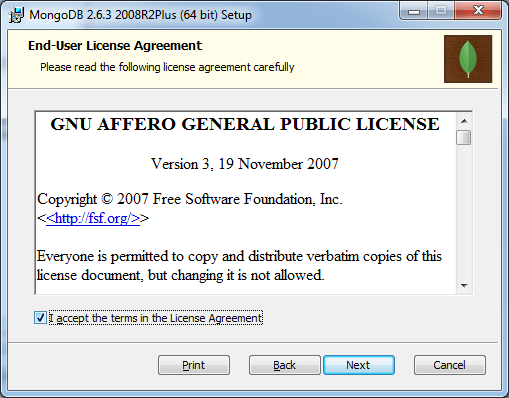 Press the Next button for the next screen and check I accept the terms in the License Agreement check box and press the Next button to continue. The next step is to choose the setup type. There are three types of setup available, Typical, Custom and Complete. For now we will choose Complete. So click the Complete button to continued the installation process. Press the Install button to begin installation process. 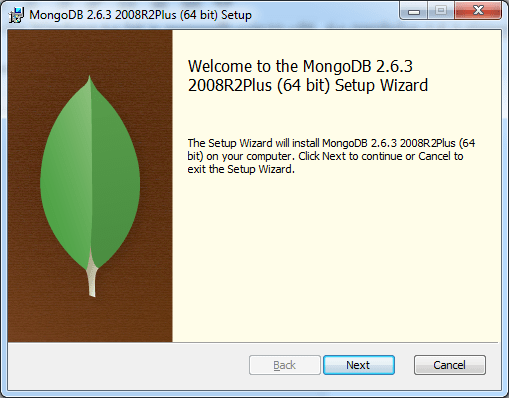 After pressing the Install button you can see the screen of MongoDB installation process. Wait until the installation is done. And finally you have the MongoDB database installed. Click the Finish button to end the installation process. The steps above have finalize your MongoDB installation. 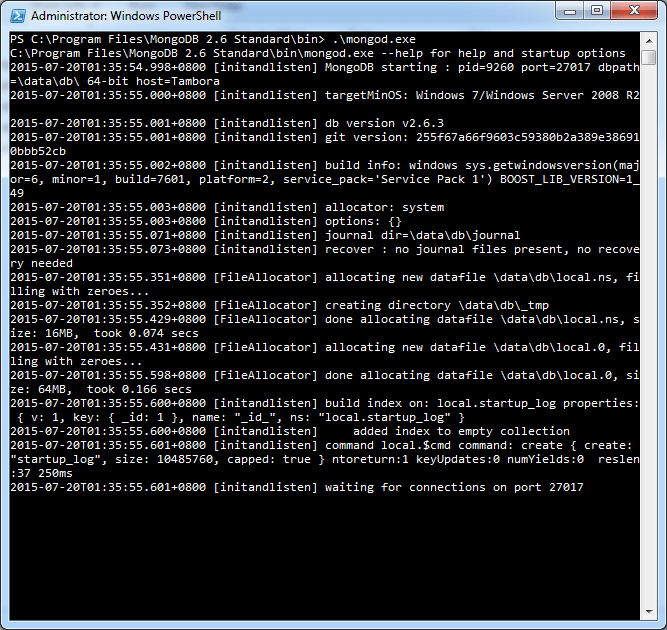 If you check in your C:\Program Files directory you will see the MongoDB installation directory in there. There will be a bin directory under C:\Program Files\MongoDB 2.6 Standard where all the MongoDB application files. Now you have install the database server lets run and check the database server. For this step we will focus on two files from the bin directory of the MongoDB installation. The mongod.exe and mongo.exe. The first executable is the MongoDB database engine daemon while the second executable is the shell program to access the MongoDB. Create data directory. By default MongoDB look for \data\db directory in the root Drive from where you run the mongod. For example you can create C:\data\db. Or you can use the --dbpath argument to tell MongoDB where to store the data. Open Command Prompt and cd to C:\Program Files\MongoDB 2.6 Standard\bin and type mongod to start the daemon. The screen above shows you that the MongoDB is successfully started, using the dbpath \data\db and it ready and listening for connections on the default port 27017. Open Command Prompt and cd to C:\Program Files\MongoDB 2.6 Standard\bin. Run mongo.exe to start the shell. You’ll see a welcome message to the MongoDB shell. use peopledb command ask the MongoDB to change to the persons collections, if it doesn’t exist Mongo will create one. To add document to the collections we can call db.persons.insert(); and passing the JSON document as the arguments. To query the collection we can use db.persons.find(). To close the shell we can call quit() command. That’s all for now, I hope this post is useful for you. 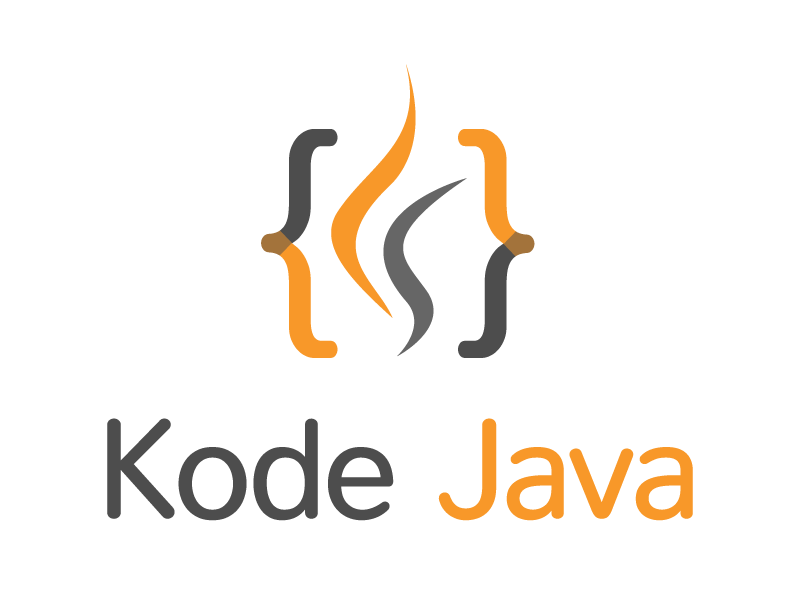 In the next post I will show you how to create a simple Java application that use Mongo Java Driver to store data using Java programming into the MongoDB database. So, see you in the next post. Thank you.